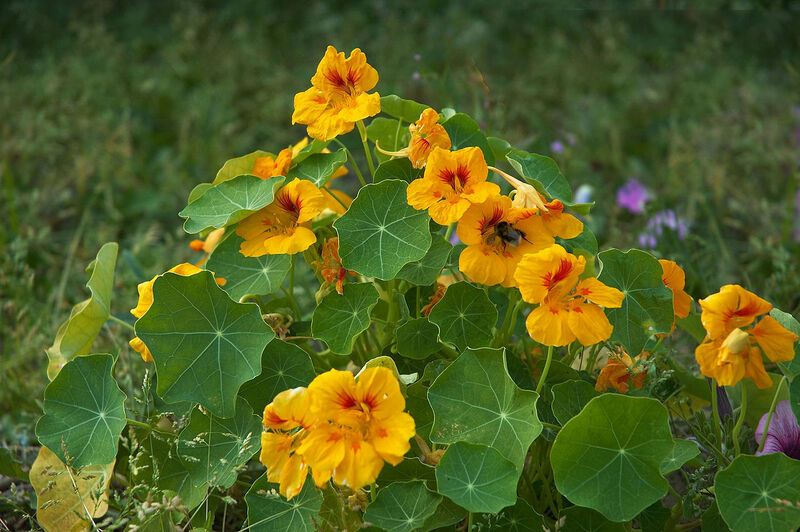 Annual (tropic perennial) herb, creeping and climbing, only known cultivated, probable hybrid origin tropical South America, naturalized and cultivated elsewhere; leaves orbicular; flowers orange to red. By headspace examination of the salt-saturated juice from raw vegetable tissue, 2-isopropyl-3-methoxypyrazine, 2-isobutyl-3-methoxypyrazine, and 2-sec-butyl-3-methoxypyrazine have been found important olfactory (green earthy vegetable-like) volatile components of fresh nasturtium plants. Benzyl-isothiocyanate and 2-phenylethyl-isothiocyanate were the most effective compounds among the purified isothiocyanates tested against 15 isolates of methicillin-resistant S. aureus isolated from diabetic foot-ulcer patients.